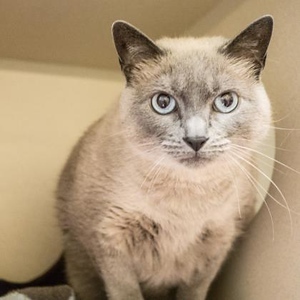 Peyton, a 7-year-old Domestic Shorthair/Siamese mix, would rather be at home getting some love and affection! Peyton is a quiet and reserved kitty, and she has not had much experience with children but she seems willing to consider sharing her home with kids who can be gentle and respectful of pets. A more peaceful home would suit Peyton just fine, and although she has not had much experience with cats or dogs, Peyton may get along just fine with another furry friend. Visit with Peyton at our Newington Adoption Center today. Remember, the Connec-ticut Humane Society has no time limits for adoption. Posted in Newington Town Crier, Newington News on Wednesday, 8 August 2018 16:12. Updated: Wednesday, 8 August 2018 16:15.